More photos from Damien's flickr set. In Disk Utility, create a disk image that contains the files you want to burn to the disc. The files must be from a volume with a Mac OS Extended disk format. To check a volume's disk format, select the disk in Disk Utility and look at the information at the bottom of the Disk Utility window. Select the disk image in the Disk Utility list and choose Images > Burn. Select the "Leave disc appendable" checkbox. If you don't see this option, click the triangle in the top-right corner. 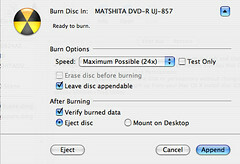 Insert a blank recordable disc in the optical drive, and click Burn. To a Mac newbie like me, the actual steps were not as straight-forward as the 5 steps listed at the Apple website. I decided it would be more efficient in the longer run if I took my own notes as reference. And since taking screenshots on the Mac was a breeze, I did so and had my own step-by-step guide. 3) Select the folder with the files to be copied, then click on the "Image" button. NOTE: Only folders can be copied, not individual files. Each time you want to copy the file, you might want to create a new folder and place the file in that folder. 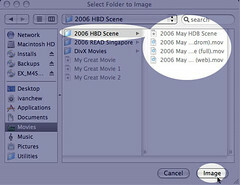 4) IMPORTANT STEP: Select "read/ write" for Image Format (if not, the CD or DVD will be closed). Click on "Save". 5) Wait while the Image (.dmg file) is being created. 6) Once the image is created, you'll see this screen. 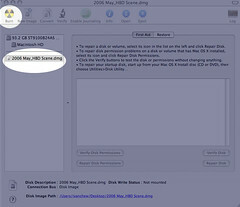 Select the image from the Disk Utility window and click the "Burn" icon. 7) Insert the CD/ DVD. If this is a brand new disk, you will see this dialog box. IMPORTANT - select "Leave disc appendable" if you want multisession burning later on. Then click "Burn". 8) Wait while the files are being copied to the CD/ DVD. 9) Follow steps 1 to 8 the next time you want to copy to the disk. When you reach step 7 and insert the previously recorded disk, you will see this dialog box. The difference is that now you see the "Append" button instead of "Burn". 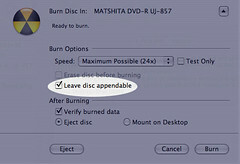 IMPORTANT -- Remember to select "Leave disc appendable" before clicking Append. Hope this helps. May it save another Mac newbie the time it took for me to figure this out. Music Experiment - "Saturday in May"
UPDATE, 30 May 06: Since quite a few folks can’t play MP4, I’ve uploaded a MP3 version over at Archive.org. Spent the last 4 hours learning how to use Garage Band from the Apple.com online tutorials, and here's the result -- "Saturday In May" (MPEG4 file, 1.8MB, playing time approx 3min 50sec). Constructive comments are most welcome. Blog the story behind your most popular post by giving the permalink, what it’s about, how it became popular and how you came to write about it. It’s a great way to see our different blogging strategies. I’ll post mine as an example soon but get started if you get the picture. He's offering prizes as well... mmm, I'll just participate for the fun of it. Besides, Kevin's been very helpful in coaching a Mac-newbie like me so I'll do it even if there isn't a prize. I can't quite tell what's my most popular post. The free site tracking tools I use don't really have that level of sophistication. I'd say that the most popular one is where there are lots of comments, and these 2 posts about the opening of the National Library last year received quite a lot: The National Library At Night and New National Library opens - 22 Jul 2005. The posts are quite straight forward and pretty self-explanatory. No real "story behind it". I just wanted to create more awareness about the launch of the National Library, and share some insights to how things were like in the first few days of opening. READ! Singapore is back again. 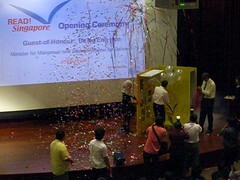 Here are some pictures from the official launch at Woodlands Regional Library on 25 May 2006. I've appended the official press release below for reference. The official site for READ! Singapore is readsingapore.nlb.gov.sg. Updates and blog posts would be featured over at the book blog, High Browse Online (www.nlb.gov.sg/highbrowseonline). While posting an update at High Browse Online the night before the launch, I was delighted to learn that some enterprising readers have started a bookclub in support of this year's READ! Singapore. Check out their blog at Bookish Clubbers. I'll be posting more updates on READ! Singapore in the next few posts, as it'll be something that will occupy me (and my Public Library Service colleagues) for the duration of the event. BTW, I'm just a bit player in this nationwide event, in case you're wondering. There's really a lot to talk about for this year's events. For one, I'm pretty sure the English book selection would go down well with Adults and older teens -- "Kite Runner" and "Tuesdays With Morrie". We've got a few Online Book Chats lined up. Any overseas libraries interested? This year is also special because the selected Singapore Short Stories have each been translated into the other official languages. I'll blog more about this later. 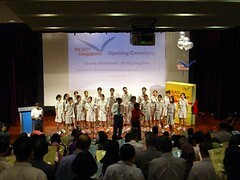 Singapore, 25 May 2006 - The READ! Singapore campaign was launched today at the Woodlands Regional Library by the Guest-of-Honour, Minister for Manpower and Second Minister for Defence, Dr Ng Eng Hen. The campaign will end 10 weeks later on 5 August 06. Into its second year, READ! Singapore, carries on from where it left off last year - to not only engage Singaporeans in a journey of discovery and reflection through an appreciation of literature but also to step back and take an analytical look into themselves and their society, and thereafter have the openness to embrace the differences around them. READ! 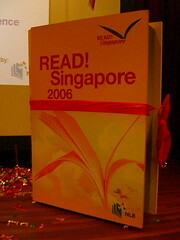 Singapore saw an increase in the number of reading clubs set up by the National Library Board (NLB) from six in 2005 to a total of 38 in 2006. The initiative, last year, led to the birth of a taxi driver's reading club, the Taxi Sifu Reading Club, which has an average attendance of 40 at every meeting. With the continued challenge to ensure that everyone in society continually upgrade themselves, READ! Singapore 2006 has now brought in the beauty industry, namely the hairdressers and beauticians, and has seen encouraging results in getting these workers to pick up a READ! Singapore book, and read and discuss it with their peers. This community effort has seen the formation of new reading clubs at hairstyling chains such as Kimage and Jean Yip Hairdressing, as well as at Dania, a beauty salon, whose members will meet regularly to discuss their thoughts and feelings arising from reading the books. To facilitate community bonding and shared experiences through reading the same books, four of the selected 12 titles are short stories which have been translated into the other three official languages respectively and published by NLB. This is NLB's first effort in adopting the role of translator and publisher. Through these short stories, entitled "Looking In, Looking Out", which is also the theme of their year's READ! Singapore, NLB hopes to create opportunities for knowledge transfer and community bonding, especially as people will have an opportunity to read the same titles across communities and later on, form book clubs and discussions with friends from different communities. Complementing works by Singapore writers such as Tan Hwee Hwee, Noor Hasnah Adam, Ai Yu and Puthumaithasan, are acclaimed books by international and well-known writers such as Mitch Albom, Anwar Ridhwan and Ashokamitran. Said Professor Tommy Koh, Patron of READ! Singapore, "Last year's READ! Singapore was a great success. Citizens of all ages and from all walks of life actively participated in the festival. Book clubs and book circles were formed. Through the discussions, we gained from one another's insights and interpretations. It made reading a book a much more pleasurable, social and educational experience. The joy of reading is one of the greatest joys of my life. 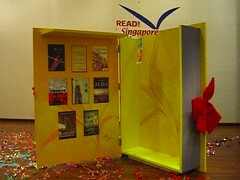 I am very happy to see that Singaporeans have become a book-loving and book-reading people. This is one of the hallmarks of a civilised society." Singaporeans can also expect to see their politicians and media personalities get into the reading act. Said Mrs Amy Khor, Mayor for South West CDC and Reading Ambassador, "As always, I am very excited to be part of READ! Singapore as reading is something very dear to my heart. I hope more Singaporeans will set aside some time from their busy schedule to pick up a book and read. It's absolutely therapeutic and good for the soul!" Throughout this year's campaign, there will be many book-based activities from reading clubs conducting book discussions, meet-the-author sessions, dramatisations among others. Some programmes that Singaporeans can look forward to include the Reading Fiesta on 3 June 2006 at the National Library with activities on reading and booths showcasing selected stories from the four languages, a print-to-screen collaboration with Canon Digital Video Fest '06, Chinese SMS contest, where the public can SMS their comments and thoughts on the three Chinese books and the fun-filled family event of Kite Runners @West Coast Park, themed to one of the books, 'Kite Runner' by Khaled Hosseini. Please refer to attached fact sheet and programme booklet for details. Noise Singapore is an arts festival for young people, by young people. Based across various media platforms, Noise Singapore is dedicated to "making noise" about the work of young artists in Singapore. This festival, an initiative of the National Arts Council (NAC), is unique in that the creative works are featured not on gallery walls, but across common communication channels, like the internet, radio, television, magazines and newspapers, to provide an alternative accessible platform to showcase creative works by young people to a wide audience. Noise Singapore aims to unearth fresh talent and inspire groundbreaking content from youths in Singapore. It is the modern creative canvas that gives young people from all walks of life the opportunity to actively participate in artistic creativity, instead of just being passive audiences. The technological and media platforms give Noise the potential to be an exciting, all-embracing, wide-ranging talent-scouting marketplace for fresh, original creative works and talents in Singapore. Singapore is the first international partner and Asian chapter of a global Noise network. Other partners are Australia and the United Kingdom. It's not just about music and sounds. Here's more stuff from the 2005 Gallery. Visit NoiseSingapore.com for more details. I started off this post with just a simple aim of highlighting the International Museum Day 2006, but somehow it got to me writing about Copyright and Creative Commons. 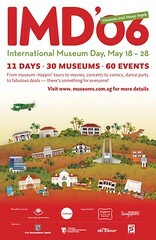 On 20 and 21 May (Sat & Sun, Singapore time) you can enjoy free or discounted entries to a few museums over the weekend. You'll be shuttled to the museums in an airconditioned bus (this is definitely free, in case you're wondering). More details over at museums.com.sg. Earlier I read Angela's post on her sneak peek of the Museum Hoppin' tour. The folks at NHB hosted some Friends of Yesterday.SG and journalists for the special preview. Friend of Yesterday.SG, Acroamatic, was also along for that sneak peek tour and subsequently shared these very nicely taken photos in his flickr account - here's his flickr photo set, and here's the slide show. Someone spotted that this photo of Acroamatic was used in the same TODAY article, without giving him due credit. Mmm... genuine oversight? In simple terms, the former means the owner of the photo (or any intellectual work) prefers a more liberal approach towards the sharing of the work, so by default the owner allows others to copy, distribute, display, and perform their copyrighted work provided credit is given. In contrast, "All Rights Reserved" means permission must be sought before using the photo or work. More details available at this Creative Commons page. But law or no law, I would like to think that in a globalised and connected society, we are bound not so much by Copyright or Creative Commons but by Common Courtesy, where we acknowledge the works of others and give credit when credit is due. Not to say that we should not have laws (we must!). What I mean is that if we teach our kids to say "Please" and "Thank You", then the concept of courtesy must extend to the Intellectual Realm. I doubt if Acroamatic will kick up too much a fuss over the oversight by the TODAY editorial staff for not acknowledging his effort in taking the photo. But it would be nice if TODAY publishes a belated acknowledgement. You can safely claim you’re Chinese if you remember eating this when you were young. 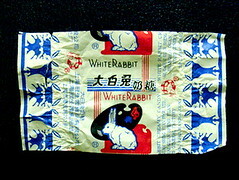 The White Rabbit milk candy was not only delicious, but fun because it had edible paper wrapper around the candy. I never noticed how the rabbits were actually high-fiving each other as seen above. Pretty funky rabbits! It's interesting how he tags that post as "Singapore Art" as well. Is White Rabbit Candy really that nostalgic an item? Should Singapore start a Food Museum? For the 1st question, much as I love White Rabbit Candy (I love popping about 5 at a go and chewing it), I don't really see it as a cultural icon. I thought I still see it being sold in supermarkets in the same packaging. But I've heard enough people say that it brings back memories, so I'm wondering why. Something about childhood being sweet and milky, maybe? For the 2nd question, I think Singapore should start one. If you google for "food museum" you can find examples like the Food Museum Online (they even have a blog), the Museum of Burnt Food (I kid you not! ), and Alimentarium Food Museum in Switzerland (which claims to be the only kind in the world). I don't think there's one in Asia, so why don't Singapore start one? Everyone seems to be talking about food in Asia. We have the annual Singapore Food Festival. Eating is practically our national past-time. We have just about all types of food from various countries and cultures. Our hawker centres are mini-ASEAN in themselves. Being a small country, finding eating places is sometimes literally a stone's throw. Come to think of it, I don't think it's true when people say Singapore is a "cultural desert". Food is a cultural asset, isn't it? The story writing is part hobby and part intellectual exercise. We've got no experience writing Children's Stories, but we gotta start somewhere and so there's no better time than "now", right? Well, I have two stories published (as mentioned at Tomorrow.sg sometime back, thanks to Olkgal) but that hardly qualifies me as an expert. On the contrary, I realise there's much more to improve. My knowledge of what makes a good Children's Story is limited to my storytelling experience many years ago. When I started out as a librarian, I did storytelling for about three years. Some stories are constant favourite for kids, even older ones who've heard it more than once. Colleagues from Children's Services have also given me some references on writing children's stories, which I'll post in the blog as well (hence, the blog serves as an archive of references and resources). We can't tell if the stories will be published. I'm sure every writer hopes to have their works published but for now, Saigon Tai-tai (my colleague) and I are aiming to get a story out. Then we'll see how it goes. I have a secondary purpose in starting a story blog. I'm interested in how blogs are used as part of the writing process. But knowing it's been done is different actual experience, so I thought why not just do it. My main concern in the book blog idea was the plagarism of story ideas published in draft. I emailed Shel some questions (he's the only author I know personally, who's based his book on a blog) and he shared that an Intellectual Property notice might help. I've put that in the story blog but in truth, that didn't really provide much assurance. Still I went ahead and posted my drafts anyway and after a while, I realised the risk wasn't as bad as I thought. For one, absolutely no one reads the blog! Perhaps this might change by a fraction after this post but still I'm not worried. I don't think the risk of plagarism increases proportionately to readership. In fact, I've realised that the risk (real or perceived) actually decreases as I know that more people are aware of the story blog. Simply put, it's like the more "witnesses" there are to the progress of the story, the greater the assurance of proof of originality -- something like that. OK, you're thinking that timestamps on blog posts can be changed, right? But there's RSS feeds to back it up, and worse case maybe the logfiles from the blog hosting service could be proof. Anyway, it's all speculation at this point whether the story we post on the story blog would be copied or modified. There's always a risk but I am beginning to sense that the benefits outweights the risks. Or to put in another way, the benefits are real while the risks might not be realised. I might blog about what these benefits are in another post. A student, whom I met at a recent meeting with youth volunteers, contacted me via email with some questions about his project. He and his project team members intended to do a project related to the promotion of reading. He asked if I would be willing to answer some questions. Sure, I replied. After a few emails, he had more questions and asked if it was possible for his team members to meet with me. Unfortunately, my schedule was packed and I had to say no. Then on a whim, I suggested we might be able to have a group discussion via Chat instead. We arranged to go online at around 9pm, and at the appointed time we "met" via IM. Created a group chat session and 2 of his team members joined in. Concluded our group discussion via IM a few hours ago, around 10pm. We even have an archive of the discussion. We have reviewed our policy in regards to the need to apply for a sketching permit in the galleries, taking into consideration feedback from the public. We welcome drawing or sketching on hand held sketching pads in the galleries using dry medium. Understandably, special arrangements can be made with SAM for the setting up of easel, large drawing boards placed on the floor, use of wet medium, and studio art classes conducted in the galleries. This came after the public letters, discussion at Singapore Heritage, as well as feedback from the Friends over at Yesterday.sg (whose comments were passed on by the NHB folks in the group). I once asked Siva if he used to be a Mac salesman. Apparently I'm not the only one who's asked him that. I'd describe his sales technique as the "making you interested by telling you the product might not be for you" style (if this is cryptic, forget it then -- insider's joke). At the same post, he tells Kenneth and I to get a Mac (actually he wants us to look at Apple's ads, which is essentially the same thing). He needn't bother, at least for me. I'd just placed an order for a MacBook Pro. First time I heard the name, I thought it was a new burger gone wrong. Now it's sweet music to my ears. Never thought I'd be blogging about this. Heck, it's just a computer. Nothing to do with librarianship. Why announce to the world? Look at the way Apple tries to convince us to get a Mac. After I wiped off my drool, it dawned on me that libraries could learn a thing or two from Apple. To use a poorly conceived analogy, I posit that libraries tend to market themselves like Microsoft. We tell people what we can do, substantial people use us, and we enjoy institutional brand recognition or awareness. Perhaps we should be like Apple, where we would be marketing the experience and appealing to customer emotions, where we'd be shameless about saying how we are uniquely different from the competitor and also touting the fact that we have seamless integration among the featured products. I did say it's a poorly conceived analogy. I'm just trying to be snazzy like Apple in talking about marketing libraries. I ain't no Steve Jobs, that I'm sure. I've never considered getting a Mac until recently. It was when I started exploring Digital Art. The PC worked fine and I was perfectly happy... until I met enthusiasts fanatics very passionate Mac users who, through conversations and correspondences, slowly but surely planted the thought about using a Mac. They told me if I'm into the right-brained stuff, then maybe I should think of a Mac. They didn't rave or rant. It was like a " by-the-way" thing which led me to find out more. When the MacBook Pro came up, bloggers were posting stuff about it. Naturally I followed the posts and conversations in order to understand what the hype was about. Even went to an Applestore and discussed with the salesperson the merits of getting a Mac. He didn't even try to sell me one. He asked why I wanted one and how he felt about using them. Someone then told me, "It's about the User Experience". Overall, a PC might be able to do the same things as a Mac but it's how the Mac enables the same things to be done together that makes the difference. That's when I really began to understand, even though I've not used a Mac up till that stage. That's when I'd started the journey over to the "Dark Side". This hypothesis just came to mind: People don't buy a Mac just because they view Apple's ads. The process starts with existing users enjoying the Apple experience, which leads to pesistent Word of Mouth, which makes people like me being aware and keen to know more, leading me to ads that are snazzy and conversational, and finally a decision is made to own one. Libraries can learn a thing or two from Apple. And it ain't just about marketing. I've been following the recent open letters to ST Forum about copying artworks at the Singapore Art Museum (SAM) with interest. The learning package I designed for my students included a drawing activity using pencils and colour pencils. Copying a piece of artwork by re-drawing it forces a student to observe line, colour and composition more closely. It is a way for students to engage with a piece of artwork, reinterpret it and understand it. Imagine my surprise and dismay when the officer on duty that day told me that the students were not allowed to copy the artwork in question. Ms Lai then questioned the rational for the restriction. I remember when I was an art student, I had the opportunity to view the great sculptor Auguste Rodin's exhibition at Singapore Art Museum. I was so inspired by the pose and form of The Thinker that I whipped out my pencil and sketchbook to make a copy of it. Before I could make an outline of it, I was stopped by an officer in an impolite manner. I was very upset about it. I appeal to our national art museum to be more visitor-friendly and encourage the appreciation of art through more engaging activities. If the museum is afraid that people would make a mess of things, it could have its officers around to make sure this does not happen. Art teachers and museum officers could inculcate the correct viewing habits and work procedures in the galleries. We do allow students to draw in the galleries using dry medium, such as sketching with pencil, crayon or charcoal. Hmm... apply for permit? I'd hazard a guess that the next question on people's lips would be, "Why can't there be a default Drawing-Allowed-Dry-Medium-Only rule rather than permit?" That's what I'd ask. SAM Exec #1: OK, how do we want to respond to these letters? SAM Exec #2: We should clarify that we have a Dry-Media-Drawing-Allowed policy, but permit is required. SAM Exec #1: Hey, this is as a classic PR opportunity, where we can turn this PR "problem" into an opportunity. Why don't we publicly announce that we've reviewed our policy and decided to reinvent ourselves. We will hence forth have a Dry-Media-Drawing policy by default! SAM Exec #2: Mmm. Good idea! SAM Exec #3: Er, guys... what if we are successful in this and get boatloads of toddlers armed with crayons and then getting creative with our walls and floors, or *gasp* the artworks? SAM Exec #1: ... ... Let's stick to "However, interested parties will need to apply in advance for a permit..."
Seriously though, I wish SAM would one day adopt a Drawing-Allowed rule by default. I believe the risks might not be as severe as we think. Risks can be managed. The positive effects could be far-reaching. For one, art students would start seeing the Art Museum as a second home, or at least a third (the second being their school). Two, it would create a perception-shift among people like me, who dabble in art as a hobby. I'd have one more reason to visit the art museum. I'd put my sketch book in my bag, pop-over to the museum on a lazy Sunday and give the ole right brain a crack. And hey, why not start selling sketch books at the SAM shop? Get something tastefully packaged and reasonably priced. If I see people sketching and drawing (like what's happening in museums in London and Paris), inspiration and motivation might come together but I don't have a sketch book -- no problem. Buy from the SAM shop. I found this incident relevant to (public) libraries. Both libraries and museums share a few commonalities. For one, both institutions are interested in attracting more locals to visit and use their facilities and services. Second, both institutions need to reinvent themselves to ensure their relevance in society. Reinventing involves innovation, and innovation involves risks. Some risks might be worth taking. NOTE: SAM has since reviewed its guidelines on this issue. Statement here (10 May 2006). Here it is -- the discussion group/ mailing list and the blog. I've blogged about how I drafted the description, objectives and intents here. Very briefly, the message I got was that a simple and coherent acronym was needed. I thought about what this group was about, and decided that it's about librarians taking the lead in discussions, advocacy and action within the scope of library disability services. Last thing was to create a name out of the letters L-E-A-D. Decided to put the "sg" in front for "Singapore Librarians". It's fitting 'cos this group is about librarians taking the lead. The rest of the words fell in place -- Empowerment, Advocacy, Disabled. I think the terms says a lot about what we hope to achieve from the standpoint of library and information services. Someone asked me, "Why are you doing this?" Another question: "What if you can't sustain this?" Answer: Sustain what? A discussion? It doesn't take a lot to maintain a discussion group. Whether there will be actions out of this, we'll take baby steps. So, I'll be passing the word around to friends, contacts and colleagues. Participation to this group is voluntary, which might be the best way to do this.